There was a time when I didn’t want to decorate my house just in case we were going to move. As the years go by, I have decided I’m pretty content where we are. That said, I still cringe when I think about how I need to replace floors and carpets and touch up paint. Our rooms will never be Instagram perfect. I’ve learned to embrace the imperfections and try to be content with what is while allowing for improvement. Contentment is an elusive friend isn’t it? That’s why when I decided to redecorate the girl’s rooms, I had a hard time showing you. The bedrooms are so tiny and we tend to like bright colors on our walls over stark whites (decidedly not the instadream perfect look). It’s really hard to photograph our teeny tiny boxes. Plus, I mean kids like knicks knacks, so I won’t show you her shelves (oh boy!). Have I also mentioned that we like to fill all the spaces? They may be small rooms but the number of stuffed animals we cram into them is really mind boggling (Marie Kondo would not approve I’m sure). In fact, just to get these sweet fishy shots, I had a huge pile of teddy bears and shopkins stacked in the hallway (I’m trying to relocate some of them to Good Will but I’ll have to do it covertly as it would never be agreed upon). But back to the flooring. When we moved in, we were painting this room (the nursery). The dog somehow got herself stuck inside the room. In her futile attempt to escape, she ripped out the carpet. Eight months pregnant with my first, I was less than pleased. We headed to Lowe’s and bought an inexpensive replacement that my husband installed. And, that is how we came to have brown carpet in one lonely room. One day, we will rip out and replace all the flooring upstairs. 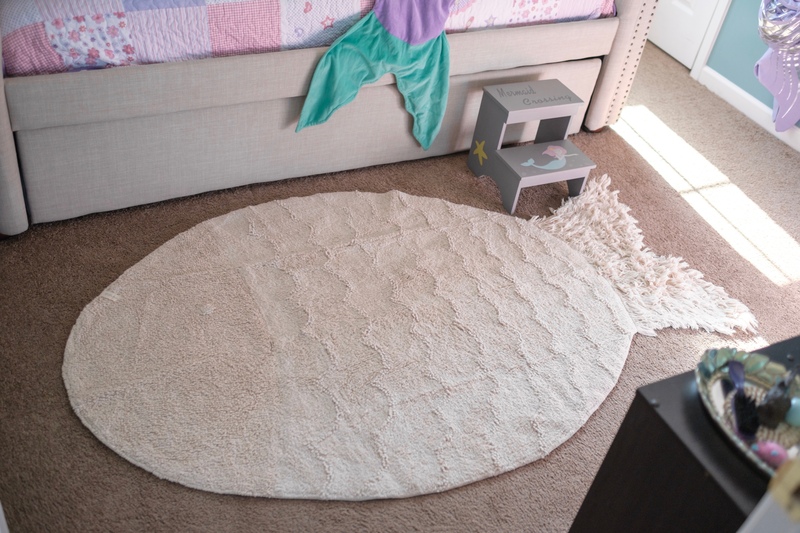 Until then, we’re content with having a Lorena Canals washable fish rug bringing some lighter tones to our mermaid themed room. I’m pretty sure our little fishies are happy as can be too. Heaven is a mermaid room with a unicorn bestie. Contentment. I’m itching to redecorate some of the spaces in our home, too! Not sure if we’ll move, but hopefully not for a while! Awww, how sweet is this? So adorable!